I will be ecstatic if they do, but I see no reason to change my prediction regarding the big nuke boats for now. Hell, I'll be glad if I am off by even two boats. If you were as careful and pessimistic with your negative predictions as you are with your optimistic praise when they do better than you predicted, I think you would get a lot less stick by our more optimistic members. It sometimes comes across as though you are hoping for failure just so you can be right. I perfectly understand... my father is the same when supporting the local rugby team... I think it is his way of coping with defeat if he never expects them to win when they do win it is gravy. Disappointment is part of life... deal with it... don't make it your world view. It is something I like about the americans... a setback is part of the learning experience... don't call it failure... it is only failure if you give up and you are more likely to give up if you never expect it to work out well. Of course Russia does not need to emulate everything the US does, like George Bush snr who said when he was secretary of state... "I don't care what the facts are America is not to blame!"... or the religious deep south reaction... a tornado just killed your family and destroyed your house and place of work... how do you feel?" "Well I feel this is a test from God and I am going to just rebuild my house and carry on." any info how many Kalinas (677 with AIP) will be ordered for RN? and how many more Varshavyanka´s besides 6 for BSF? MOSCOW, August 4. /TASS/. The Novorossiysk, Russia's new Project 636 (Varshavyanka) diesel-electric submarine has completed trials in the Northern Fleet and is ready to sail to the Black Sea to its permanent base, Northern Fleet acting spokesman, Captain 2nd Rank Andrei Luzik said on Tuesday. The Novorossiysk submarine has completed its trials with a cruise missile launch from the Barents Sea against a target at the Chizha firing range in the Arkhangelsk region in north Russia, he said. "Today the crew has completed a cycle of the ship’s basic preparation, replenished provisions and is fully prepared to make an inter-fleet passage from the Barents to the Black Sea to its permanent base in Novorossiysk," the spokesman said. During the period of its stay in the Northern Fleet from November last year, the submarine successfully performed its submersion to the maximum depth and the check of its armament and technical means while carrying out live torpedo and missile launches in the Barents Sea, the spokesman said. Varshavyanka-class diesel-electric submarines feature advanced stealth technology, extended combat range and the ability to strike at land, surface and underwater targets. They have been dubbed "black holes in the ocean" by the US Navy because they are virtually undetectable when submerged. ROSTOV-ON-DON (Sputnik) — A new Russian Varshavyanka-class Novorossiysk submarine will hold a four-day military exercise in the Black Sea, a source in Russia's Southern Military District told RIA Novosti on Thursday. On Wednesday, Novorossiysk, the first new Russian Black Sea Fleet submarine in the post-Soviet Russian history, passed the Turkish Straits and arrived to its permanent deployment in the Black Sea. "The navigation in the Black Sea is completely different. Besides, the Black Sea basin has peculiarities associated with hydrogen's occurrence," the source said, adding that one of the drills involves the submarine crew's adaptation to their new environment. "After completing the training missions the submarine will arrive in Novorossiysk — its stationing site — on September 21," the source pointed out. Russia's Black Sea fleet submarine Novorossiysk returned to the Novorossiysk Naval Base, according to Russian Navy spokesman Capt. 1st Rank Igor Dygalo. 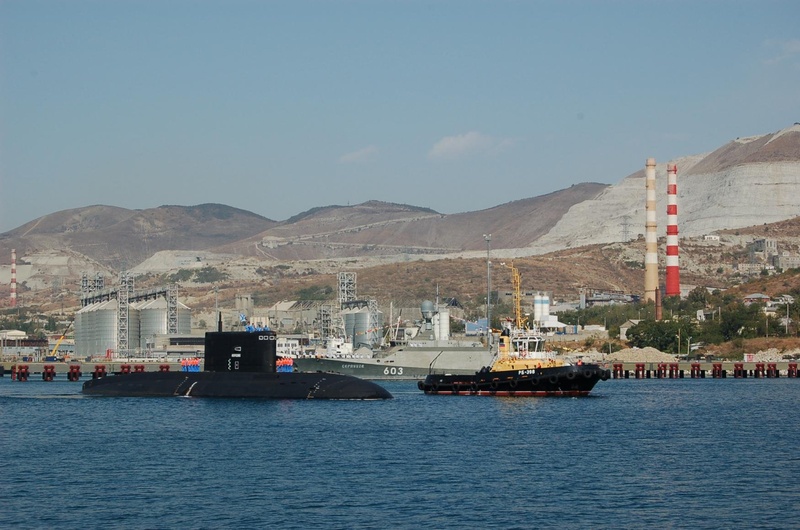 MOSCOW (Sputnik) — Russia's Black Sea fleet submarine Novorossiysk has arrived at its permanent location at the Novorossiysk Naval Base in the south of the country, Russian Navy spokesman Capt. 1st Rank Igor Dygalo said Monday. According to Dygalo, Russian Commander-in-Chief of the Navy Adm. Viktor Chirkov, Black Sea Fleet Commander Adm. Alexander Vitko and Novorossiysk Naval Base Commander Capt. Oleg Shastov were among those attending the arrival of the submarine. The Novorossiysk is a Varshavyanka-class submarine, the first new Russian Black Sea Fleet submarine in post-Soviet history. During its stay in the Russian fleet since last year, the submarine successfully underwent maximum depth submersion and military and technical capacity verification procedure trials. Last week, it was announced that the Novorossiysk was involved in a four-day military exercise in the Black Sea. Nice pic of the Novorossiysk with Serpukhov in the background. Vladikavkaz, a Kilo-class diesel submarine first commissioned by the Russian Navy in 1990, will return to service on Wednesday. MOSCOW (Sputnik) – The Russian Navy will accept its advanced diesel submarine into service a month ahead of schedule after extensive overhauls, a Navy spokesman said Tuesday. "The Navy will accept the repaired and upgraded Project 877 diesel-electric submarine Vladikavkaz a month ahead of schedule," Capt. 1st Rank Igor Dygalo told reporters. Dygalo said the Vladikavkaz, a Kilo-class diesel submarine first commissioned by the Russian Navy in 1990, will return to service on Wednesday having had its military and performance characteristics significantly improved. He cited Navy Deputy Commander Rear Adm. Viktor Bursuk as saying the overhaul included hull, equipment and other system repairs, as well as upgrades to communications, navigation, traffic control, naval combat data, propulsion control and other systems. Vladikavkaz passed all the speed, handling, noise and many other parameters designated by the Navy during tests in early August 2015, the Navy spokesman added. The ceremony marking the signing of the submarine’s handover is slated to take place at the Zvezdochka shipyard in north Russia in the presence of the Main Command of the Navy. Kilo-class submarines, sometimes dubbed "Black Holes" for their ability to "disappear," are thought to be one of the quietest diesel-electric submarine classes in the world. More photos of the Novorossiysk Passing through the Bosphorus. Five photos including a couple of head-on shots. Capt. 1st Rank Vyacheslav Trukhachev said that Russia's submarine Rostov-on-Don has completed verification tests. MOSCOW (Sputnik) – Russia's submarine Rostov-on-Don has completed verification tests, and is on the way to join the Black Sea Fleet, a spokesman for the fleet, Capt. 1st Rank Vyacheslav Trukhachev, said Friday. The submarine is expected to arrive to its permanent location in early December, according to Trukhachev. The Rostov-on Don is a third generation Varshavyanka-class submarine designed to modernize Russian Black Sea Fleet submarine capacity. In September, Russia's Black Sea Fleet submarine Novorossiysk, the first new Russian Black Sea Fleet submarine in post-Soviet history, arrived at its permanent location at the Novorossiysk Naval Base. Earlier on Friday, Russian submarine Stary Oskol arrived at the main naval base of the Kola Flotilla of the Northern Fleet for further testing. As soon as it successfully undergoes a comprehensive military and technical capacity verification procedure, it will leave to join the Black Sea Fleet. why dont they transfer subs trough internal russian waterways -using north canal-volga-don-azov. Rmf wrote: why dont they transfer subs trough internal russian waterways -using north canal-volga-don-azov. Because it can sail under its own power in open seas, while on river-canal system it will require a floating dock to transport it. needing western "ubber tech" to achieve any progress. NATO should be careful. The story of arrogant invaders trying to dominate Russia has been very sad. According to the statement, a flag raising ceremony for the warship will be held in Saint Petersburg. 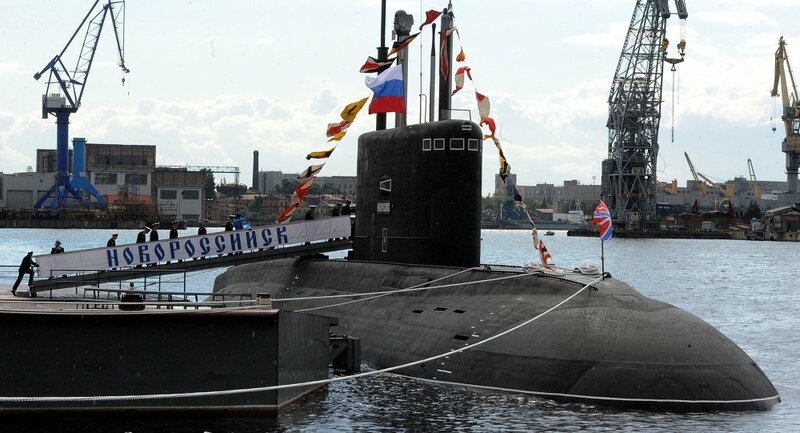 The Krasnodar is the fourth of six 636.3 Project submarines, all expected to be in service by the end of 2016. They feature advanced stealth technology, extended combat range and the ability to strike land, surface and underwater targets. The first, the Novorossiysk, has already joined the Black Sea Fleet. The second and third ships, the Rostov-on-Don and the Stary Oskol, will join the fleet after undergoing armament trials with the Northern Fleet. Russia is currently performing a $325-billion rearmament program to achieve a 70-percent modernization of its military by 2020.